MaiTai's Picture Book: Cheap and chic playtime - 'C'est la fête' continued..
Cheap and chic playtime - 'C'est la fête' continued..
Have a wonderful remaining weekend, and a great start into the new week! love your bracelets! the color is great! I love these capsules with the subtle changes in colours, which create such different looks. Very classic/classy. The gray sweater was a real find, it just blends so effortlessly into all the different looks, and enhances them. Is this a different cw of CLF? Keep warm, dear Sanne! Many thanks for the suggestion, I love requests :-) Macs is right, life is crazy busy right now, but looking forward to do a post with a shirt and the sweater very soon! I adore the burgandy pants and grey sweater. And those shoes are wonderful! Great capsule! 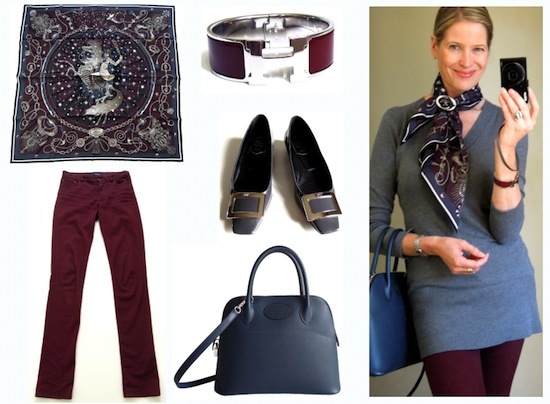 Love burgundy and bordeaux in all variations, wine, bracelets, scarves and trousers! It seems we're twins in both cws! Love the combo here, drawing on the jewel tones. Also fabulous with grays (like the sweater and your your stunning Viviers) and even creamy beiges. Lovely as always, have a great week! How fun, dear Julian.. double twin hugs to you! Will try creamy beiges next, great suggestion :-) Have a fabulous week too! I too am a huge fan of CLF and ironically have the same two colors you have....but must confess to having a third!! Love what you have done with all of them....they are so much fun to wear!! I do believe your color way on the last posting should be 05 not 12. Cant wait to find out what " H " boxes are under your christmas tree this year.....wishing you and your beautiful family a joyous holiday season!! The double twin club is growing, and it looks like you are leading the triple one! Would love to know which one your third CW is.. Thank you for spotting the error re the CW, it's already corrected :-) In a further twist, the above should really be called prune/marine/gris fumée, like on the lesailes video at h.com. But for some reason, it then got mixed up with CW05, and it is now called bleu nuit/gris/prune. Originally, I wanted the bleu nuit/gris/prune (where the horseman wears red boots), but when the above arrived I loved it so much that I decided to keep it instead..
Well its so ironic you should say that as I asked my SA to get me o4 prune/ marine/ gris fumee AND o5 Bleu nuit/ gris/ prune.... (at least these are the way that H is ticketing them..)..but she sent both... one like yours above with prune background, the other is more navy and grey with the prune hat and boots. Loved them both so much....kept them so have one to wear with prunes and grey the other with navy and grey! What a wonderful print for all of us to enjoy!!! I love every single piece of this outfit. Especially, how this gorgeous scarf includes every color of your outfit - it's the perfect accessory. The bracelet as well, of course. So elegant without 'much ado' ;-)... you are always an inspiration. Thank you! Congratulations to you too, dear SA! So nice to be twins with you. The CW mix up must have led to many surprises, but since all the colors are beautiful, it does not matter that much in the end! I meant to order the one with the red boots (having taken my clues from lesailes), but when this one arrived instead, I fell for it immediately. Enjoy yours too! Seems Hermes really did make a major blunder with the cws!! I agree they are all fabulous in their own way and the design is just a WOW! It's a 31 rigide, the leather is Epsom. thanks for your reply :) I love your taste... elegant and classy!! !